Irasshaimase!! Welcome to the Cosplay Cafe! 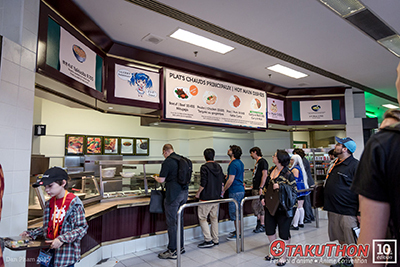 The Palais des Congrès cafeteria will once again transform into the Cosplay Cafe! 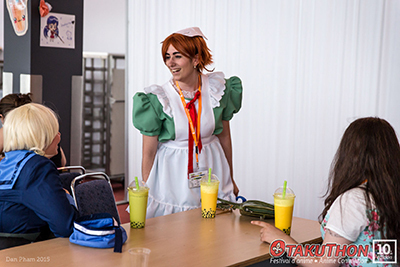 Cosplaying hosts and hostesses will welcome you with a smile! Over the years, this location has become a relaxing spot not to be missed with its giant tent on the terrace, mini-stage, programming and, of course, its Japanese menu prepared just for this big event! 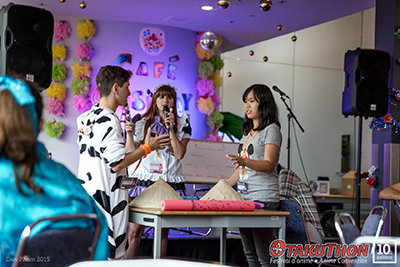 The Cosplay Cafe is a hangout for tired Otakus who want to rest and refuel. But don't start thinking that it's just a boring place. Quite the contrary, actually-- a variety of games, musical performances and karaoke will be waiting for you on the mini-stage! 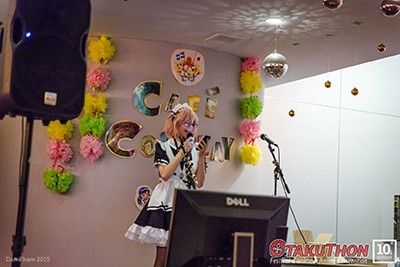 There will even be a karaoke contest where the best will be able to face off against each other! Looking for a meal or a snack? Has it been a long time since your last Bubble Tea? If you answered yes, then come recharge at the Cosplay Cafe!